Have you been out in the woods lately? If so, you are lucky the mosquitoes and flies haven’t carried you away. With all the rain we’ve had this year, we have breeding grounds everywhere. On top of that, there was news this past week of both a bird testing positive with West Nile in Marathon County, and the discovery of a species of mosquito that is capable of carrying Zika in Dane County. I realize that this is an absolutely terrible way to start an article that is supposed to encourage you to get outdoors. The reality is that we want you to learn more about your land, but be safe and wise about it, so I’ll cover a few nasties in this month’s article. Getting back to mosquitoes, I just spent two days this weekend on a forestry field tour. Aside from the annoying buzzing, with plenty of preparationthey didn’t get in the way of my enjoyment of being in the woods. There are many brands of clothing out there that are very lightweight, which means you can wear pants and long-sleeved shirts without sweltering. There are some brands that are pre-treated with permethrin, which passed EPA tests, but you still need to wear repellent on exposed skin for full protection. In regards to repellent, there are many options out there from natural oils to full on DEET, and what works best depends on your conditions. The EPA has a repellent selection tool where you plug in the pests and time spent outside, and it will give you a list of products. Pests choices include mosquitoes and ticks. While you are at it, add some bat boxes and keep some bat trees in your woods for further mosquito control. Ticks are the next pest that is getting in the way of our outdoor enjoyment. In many ways, the same rules apply here as with mosquitoes: wear long clothes and hats, tuck pants into socks, and wear repellent. Since ticks are easier to capture than mosquitoes, it is helpful to know what tick(s) you might be dealing with ( UW-Madison has a tick identification page ). And if you are feeling any tick disease-related symptoms, always mention to your doctor that you spend time outdoors. As someone who reacts to poison ivy, I’ve gotten quite adept at seeing it from far away. Unfortunately, if you are allergic to it, your reaction to it grows with every exposure. Since it tends to grow on edges with some sunlight, if you avoid the shrubby edges of your woods or trails, you should be okay. Of course, if you are bushwacking your way through the woods, that may not be an option. Washing with soap and water immediately, is one option. I have carried Tecnu with me if I can’t get to soap and water right away. You can rub some of that on, then wipe it off with a cloth (non-poison ivy exposed, of course). Luckily, poison ivy can be controlled either through pulling/cutting or herbicide. Do not burn it though, as the oils can be transported in the smoke. And the final pest I want to talk about is wild parsnip. As with the rest, long pants and sleeves can help prevent exposure to the oils. 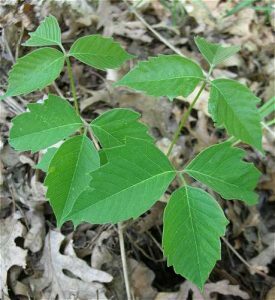 And as with poison ivy, this one will also occur in sunnier areas in fields and along any edges in your woods. (This can also include trails, if there is enough sunlight coming through.) 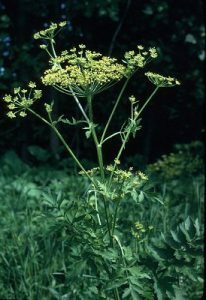 Wild parsnip is a sneaky bugger; the oils that get spread on you don’t react until they are exposed to the sun, causing phytophotodermatitis. It is recommended that you cut or mow wild parsnip, after sunset, repeatedly for best control. There are some herbicides as well, though you will likely have to return several times. The purpose of this article isn’t scaring you into not enjoying your woods. In fact, quite the opposite. If you know what to look for and how to take precautions, you can increase your enjoyment knowing that you are avoiding the things that can take you down.